Review: A young, talented getaway driver is being coerced into working for a crime boss. He finds himself taking part in a heist doomed to fail that threatens his life, love and freedom. Here comes the film Baby Driver, from the same director who worked on all the Three Flavours Cornetto film trilogy. The soundtrack to the film is just incredible and I am looking forward to getting the CD as soon as it is out. You could say that this film is very similar to a musical in the way it all plays out. The two actors that really stood out for me were Ansel Elgort and Lily James. It was great seeing Lily James adopting a different type of role. The editing and cutting is just superb. The pace is really exhilarating and keeps moving. The film opens with one of the best car chases since Bullitt (1968). Edgar Wright has revealed that during the car chase sequence that there was little to no CGI or green screen used. The driving was the real thing. Jon Hamm’s role was written for him. Although originally set in LA, the film was finally shot in Atlanta. This is the first Edgar Wright film to be shot in the United States. This film contains many classic ingredients but manages to feel very fresh, original and stylish. 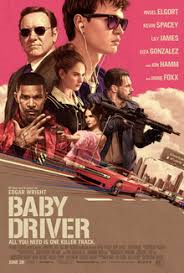 Did you know that this film is named after Simon and Garfunkel’s song “Baby Driver” from their 1970 album “Bridge over Troubled Water”? The song appears during the end credits. At the Bafta Awards in 2018 this won for Best Editing.